I am planning to go to landour in february 2019 for a couple of months to learn hindi. The landour language school seemed like the best choice in terms of learning hindi, going alone and meeting other people. There are a couple of things I can't figure out myself though, and I was hoping some of you on here might be able to help me. 1. There are quite a few hostels listed on the LLS website, but the prices aren't always clear and I would like to stay somewhere where other travellers/internationals are staying as well. Any ideas as to what hostel/lodgings is best for the budget and making new friends? 2. There seems to be a lot of confusion as to what kind of visum is needed for a couple of months stay. Does anyone know more about this? 3. And any extra info about the town, the surroundings, the school and all that would be greatly appreciated as well! Also, if anyone happens to go there in the same period as I'm planning to go, do let me know!! Go on a tourist visa. I don't think Landour can arrange a student visa. I was there more than 10 years ago, and the landlord of the place I stayed has passed away so I'm not up to date on accommodation info for you. But at that time, all the places up in the Landour area were nice to stay in and easy to find other friendly guests many of whom were studying too, but rather expensive by cheap Indian standards. Also, within the first few days of classes, I met lots of other students and managed to arrange sharing a room with someone, but rooms are in very short supply up there on the hill due to limits on construction. It was much cheaper and easier to find rooms down in Mussouri, but the walk up is quite a vigorous steep walk. You can find the prices by contacting the places yourself, rather than hoping that someone will update the Landour website with every last detail. Down below you will find long threads with some useful information.. Originally Posted by NonIndianResident Go on a tourist visa. I don't think Landour can arrange a student visa. Originally Posted by edwardseco Down below you will find long threads with some useful information..
Yeah, there are a few about landour, but most of it is from years ago, and things change. Some of the recommended housing options, for example, don't exist anymore. I just hoped that there were people on here who could tell me what there is now. Originally Posted by zandhoopje Hi everyone! Is learning Hindi the focus, or meeting and hanging out and meeting other people ? There are two kinds of language learning styles for adults, outside of credit bearing academic setting. Casual, and serious. The above is a serious one, and it's free. One could learn the language for free, and then head to India better equipped in the language. And you can hang out and meet many "other" people at many places outside Landour, in many other towns where they hangout. Serious or light is the question. Serious requires immersion.. Originally Posted by edwardseco Serious or light is the question. Serious requires immersion..
Yep. That is the best way to learn a language I think. That's why I wanna do it in India. Originally Posted by nycank Is learning Hindi the focus, or meeting and hanging out and meeting other people ? Originally Posted by zandhoopje Yep. That is the best way to learn a language I think. That's why I wanna do it in India. I thought Landour was good. It forces you to do immersion for up to 4 hours a day (as much as you choose to pay for). Otherwise I find I have been able to stay in India without trying to speak Hindi for long stretches at a time. 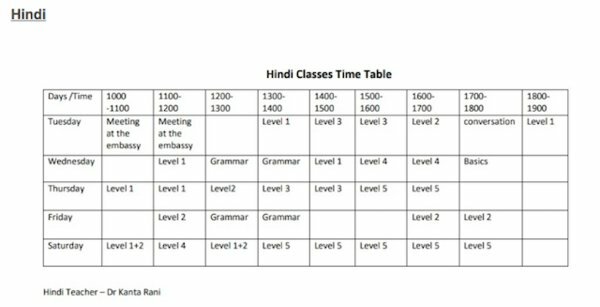 The instructors are very good at speaking only Hindi to you in your class time, and speaking at your level, encouraging you to speak, and letting you direct whether you want to do language exercises and drills or straight conversation, or reading, or whatever. I did Urdu reading with one instructor, just conversation with another (who liked to go for walks as our session) and textbook work with the other two. I diligently did my homework too, so I had lots of hours of Hindi per day.